Are you ready to discover all the benefits of Pu Erh tea? Then, you have come to the right place! Feeling uncomfortable after a heavy meal? Are you struggling with those extra pounds? Benefits of this tea include helping you to improve your digestion, burn fat, build muscle and much more! So get your tea cup ready and enjoy every step of this wonderful journey into Ancient China. Before we begin talking about the benefits, first let us tell you a little about this Chinese wonder tea. This powerful nectar stands out for being a post-fermented tea and for its processing methods. There aren’t many quite like it. It has such a peculiar character that it cannot clearly sit among either green or black types of tea. Therefore, Pu Erh tea is often considered as being a type of tea by itself, and its classification is a matter of discussion. Much like a good wine, this tea can be aged and the taste gets better and better over time! But don’t worry, when stored and aged correctly, its benefits don’t lose their strength and your tea remains amazing and healthy throughout the years! So let’s go on and learn more about the benefits of Pu Erh Tea. Pu Erh tea offers you tremendous health benefits. Like the other types of tea, this medicinal tea contains a high amount of antioxidants that protect your mind and body from diseases and environmental threats that surround us. Have a look at these amazing health benefits of Pu Erh tea. Are you looking forward to putting on those tight jeans or that bikini without feeling a little awkward? Okay, don’t feel stressed. Help is on the way! Pu Erh tea has also been known as “the king of burning fat”, as it accelerates your metabolism and makes you burn fat (build muscle, too) faster. So how can you and Pu Erh tea work together? Well, start changing your lifestyle and this tea will prove to be an amazing helper. Eating healthier foods and drinking this wonderful tea, especially after meals is the key to a successful diet! Don’t forget to add exercise to your daily routine and you will find that it’s not that hard and you will love it! Once you try those clothes on and look at yourself in the mirror you won’t regret it! You will feel amazing and much healthier! This is the perfect tea to drink after a heavy or greasy meal. The antioxidants in Pu Erh will aid digestion, speeding the metabolism and dissolving excess acidity, so if you tend to suffer a bit after meals, have a cup of Pu Erh to help digest and feel lighter! Another of the amazing benefits of Pu Erh tea is the ability to fight free radicals and increase blood circulation, thus reducing the risk of cardiovascular diseases. Our heart is precious and drinking Pu Erh is a great way to protect it! If you want to lower blood pressure and blood sugar levels, try drinking this powerful pot-fermented tea and feel your heart beating strongly by the minute! Waking up after a night out is not always easy, especially if you have a hangover! Pu Erh tea can give you a hand to reduce the negative effects of alcohol consumption, so get up and prepare a cup of Pu Erh tea. You will feel better and that horrible headache will be long gone. The caffeine will deal with your headache while at the same time this tea invigorates the liver and spleen, helping you to recover from alcohol damage. The presence of antioxidants inhibits the growth of cancer cells and the development of rheumatoid arthritis caused by free radicals. Drinking tea on a daily basis will boost up your metabolism, making you stronger to prevent tumors and ward off attacks from viruses and bacteria. So keep drinking Pu Erh tea and keep yourself and your loved ones healthy. Are you a caffeine lover? Do you love to feel that caffeine boost in the morning to help you get up and go to work? Caffeine in tea is healthier than in coffee and you will feel it working up to 6-8 hours. Tea also has an amino acid named theanine that calms you down, so you will always feel alert yet relaxed at the same time. It’s the perfect match! This tea may also help you to improve your eyesight and help to fight tooth decay and bad breath. Enjoy the health benefits of tea! As Pu Erh is an aged tea, you have to be careful with fluoride. Many cheap and low quality Pu Erh teas contain fluoride and, when consumed over time, may cause fluoride poisoning. Therefore, make sure you always buy your tea in a trustworthy tea shop and that the tea is from the Yunnan province. There are many Pu Erh fakes out there, so be careful! 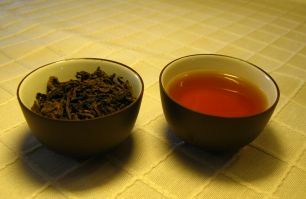 Only quality can assure you that you are getting the most out of the benefits of Pu Erh tea. Finally, remember that this tea contains caffeine and so should be taken in moderation. Try to avoid it at night, so that you have no trouble falling asleep. To enjoy the powerful benefits of Pu Erh tea, it's important to keep a few tips in mind, so let’s learn how to make Pu Erh tea and get the best brew for you to drink. Make sure you use spring water to avoid the chemicals in tap water that may alter the flavour of your tea. Use 5-8 grams of tea for 250ml of water. If you are using a tea brick, be careful and use a knife to cut off the tea gently. For this post-fermented tea, bring your water to a boil. However, before brewing try rinsing the tea with boiling water first and discard this first water. The idea is to remove any impurities and to allow the dry leaves to expand. This is particularly important when using a tea brick. Now the leaves are ready to release their dark reddish colour and enchanting aroma. Boil water again and pour over your tea leaves. Let it steep for 2-3 minutes. Later, you may change this steeping time according to your personal preference. Behold the leaves dancing and unfolding. Your tea is gaining life and the benefits of Pu Erh tea are almost ready for you to absorb. Now, stir and pour the tea into the tea cups. You may brew Pu Erh tea 2-4 times, reusing the same now loose tea leaves, but make sure you increase the steeping time in each infusion, otherwise your tea will be weaker with each brew. 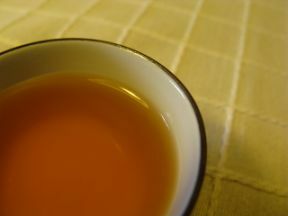 It’s best that you do not add any sweetener or milk to your tea so as to fully enjoy it and not alter its taste. If this is your first time drinking Pu Erh, you should drink it unsweetened in order to get an unbiased feeling for what is a post-fermented tea. After this, if you have a sweet tooth, it is always better to choose honey as it is natural and the health benefits of honey are tremendous! Here’s a tip: Make sure you store your Pu Erh correctly, in a cool dry environment and avoid any odor or light. This assures that you are protecting the properties of your tea. And now that you have learnt how to burn fat with Pu Erh tea as well as how to make it either from loose tea leaves or from a tea brick, share it with family and friends and let them also enter the wonderful world of the benefits of tea! Buy Your Pu Erh Tea Today! Click on the image or on the link below to purchase from Art of Tea your Pu Erh sampler. Why settle for one Pu Erh tea when you can taste four different varieties of this tea? The best way to get acquainted with this tea is to expand and challenge your palate with a good set of samples. Buy your Pu Erh sampler here! pick your pu erh now! Do not stop here, there is much more to know about Pu Erh Tea so read on and discover how this singular tea gets into your cup.